A six-week-old baby gorilla is being treated in a German paediatric intensive care unit after being rejected by its mother. 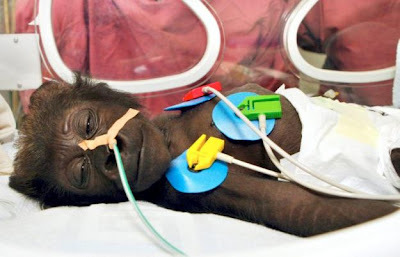 Mary Zwo was admitted to Muenster University Hospital after staff at the local zoo found her dehydrated, with low blood sugar levels and on the verge of hypothermia. Her mother Gana, who appeared to care for her baby very well at first, had started neglecting Mary Zwo after she was separated from other gorillas at the zoo. The mother and baby had been segregated following several incidents in which the father, N’Kwango, had attacked the baby gorilla severely, the zoo said in a statement. According to the hospital, Mary Zwo‘s condition is currently stable, although she still has some difficulties drinking from a bottle. The zoo said she was admitted to a hospital for humans because a veterinarian clinic would not have been able to provide her with the level of care required. 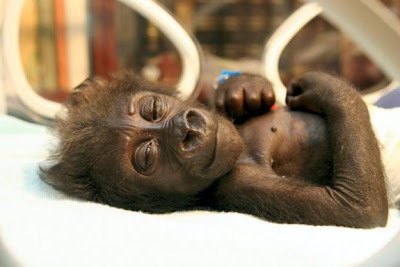 I think that all monkeys should all be free i love baby gorillas.